Umm, hello, cozy knit sweater with a party going on in the back. To say that I am obsessed with everything at Express right now is an understatement. They have so many amazing tops and sweaters which includes this saddle brown sweater . And, as I already told you, my favorite jeans are from there too #shortgirlfavs. If you haven’t found that perfect pair of over the knee boots yet, these Vince Camuto are on major sale ($60 off) and are seriously the best that I have found. They are the exact height and exact quality that I was searching for in this gorgeous color. Who doesn’t LOVE having pearly white teeth?!? Let’s just say that I thought that the over the counter whitening strips worked great until I tried this legit whitening kit from Smile Brilliant. Smile Brilliant sent me an entire kit to test which included everything that I needed to get that bright smile, and it also included the impression set so I could get custom fitted trays. I was super excited about my own peronal trays. I bring my kit everywhere with me even to my blog shoots. It only takes 15 minutes a day to get results. 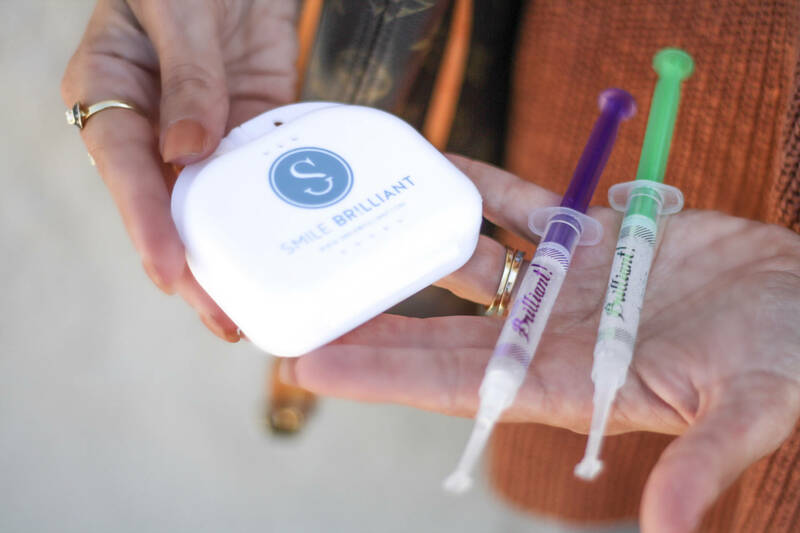 I teamed up with Smile Brilliant to give one of my followers this entire teeth whitening kit absolutely FREE. Enter to win by simply submitting your name and email address HERE. You can also use code dashingdarlin for 5% off of your purchase. GOOD LUCK!! Thanks for taking time to stop by my blog. Hope that you have an amazing week. This sweater is perfect for the fall! I love the color of it. Pairing it with the white jeans is such a good idea. 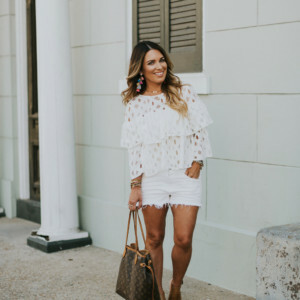 I’ve always wondered how I can incorporate my white jeans into my fall wardrobe without looking like a fashion flop and this inspires me to bring them out and rock em! I love the look of this sweater! SO NOT your boring sweater. I love the detailing in the back. I just can’t decide which color to get! Definitely a great staple for the fall/winter season! I’ve said this before but your hair is to die for!!! I love this cozy orange sweater on you. The color is so perfect for fall. I love everything about this outfit! The color of the sweater, the back details, the white jeans..everything! Plus your teeth look amazing girl. I am using Smile Brilliant now and can’t wait to see the final results. I just LOVE smile brilliant! Your teeth look so amazing! Oh my gosh this outfit is perfect! I love that back detail on the sweater! Love this outfit especially the boots and sweater! Love that color on you!!! So gorg! Wow, you are so stunning miss! I love that sweater. So perfect for fall and cozy. 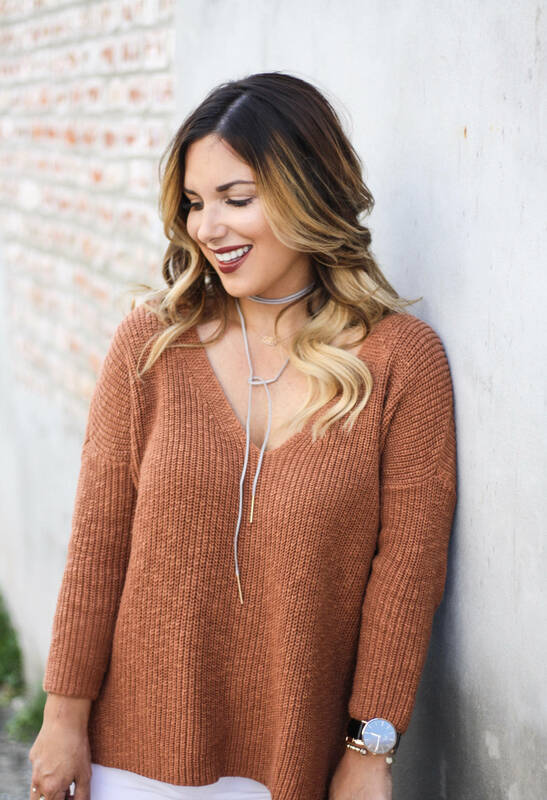 I love this sweater – the color is perfect for fall and the lace-up back is darling! I need to look into some teeth whitening as well. 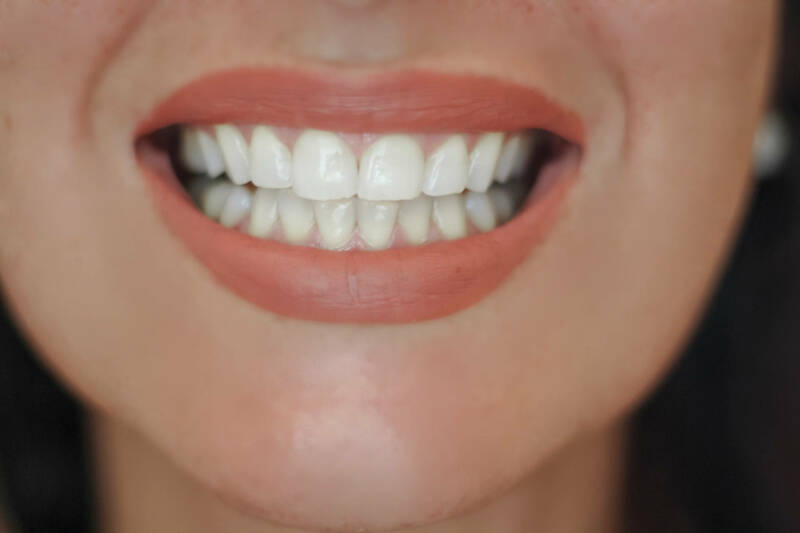 I recently worked with Smile Brilliant and love the results! Also, that sweater is too cute and I love your hair color! Love that sweater so much ?? perfect styling with the white jeans and boots!! That orange color is stunning on you! Love the pop of lip color too! This sweater is SO cute! Express seriously has the best sweaters! I love the color and the lace up detailing in the back! This sweater is amazing! I’m obsessed with the back of it!!! This sweater is amazing! Taking the lace up trend to the back–very unique find lady! That sweater is gorgeous! Also, I’m all about teeth whitening! Coffee and wine drinker probs! I am LOVING that sweater! It is amazing on you! I think I need it…. I don’t think I could pull off the thigh boots because I have short little legs (wah) but you do beautifully!!! And your teeth whitening results look amazing, I will definitely have to try it!! Really enjoyed this post! Love the sweater and how you paired it with the other elements in your outfit to make it flow! What a great sweater! I absolutely love the color on you! I am OBSESSED with your lace up sweater!!! I adore any “party in the back” because it’s such an expected pop of fun. This one is too perfect!! And adore those boots!! Your smile looks gorgeous and I love this sweater! I’m all for that awesome peek-a-boo lace up back, so cute! Love the criss cross detailing on the back of your sweater! The color is perfect for fall and I love that you paired it with white jeans! So cute! Do you ever look bad?! 🙂 Love this sweater, the details on the back are fabulous…one of my faves this season. The color looks stunning with those otk boots, and what a great price! And your teeth, yep, pearly white!! Happy to know that brand doesn’t cause sensitivity, that’s usually a struggle for me. Love this blog! loving that sweater and your lip color! so pretty for fall! 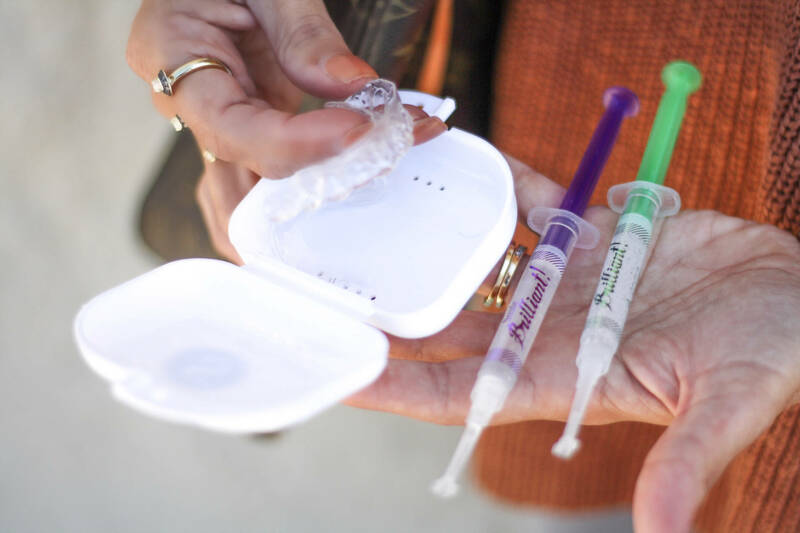 and i can’t wait to try my smile brilliant kit! I am in love with that sweater! The criss cross back is the perfect detail! and I love those boots! Gorgeous! Such a perfect fall look! I love that sweater, especially the back! The back of that sweater is so cute!! Wow! this is such a cute look, i love the lace-up on the back and how you styled it with the choker! girl you know I love the back of this so pretty! Absolutely love your photos and the color palette in this! Great job! Such an adorable sweater. It looks soft, comfortable, and I love that color! The color of that sweater is gorgeous! Love the back detailing! 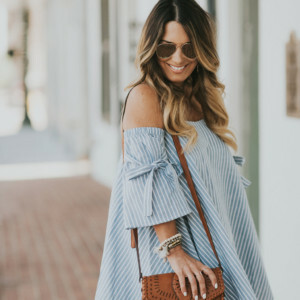 Great outfit! I especially love the sweater — perfect for a night out, or for a warmer winter climate like AZ! Also – your hair looks amazing – love the color! Girl! This sweater is incredible! It’s so chic and looks so cozy, too!! I love the back of this sweater!! I was actually at Express the other day and I saw this sweater! I was immediately drawn to the back and how awesome the detailing is! That sweater is fall perfection! Love it! Whoa baby your teeth got white! I need to try this stuff! Mmg akan ada jugak 1-2 yg terbuat, tapi tidaklah sampai wife bi&Mig2s#8230;naklumlah, nak tunjuk contoh yg baik utk anak2..kita yg kena buat dulu benda2 baik ni… =) hafizmd recently posted..